Pearroc Ciele poured Fae power into the newly learned wizard spell. Even as it flashed lightning bright, he recognized the weakness that shattered through the spell. wizardry. He might be too weary to rise from the chair provided by the arena master, but his black eyes snapped onto a flaw and his quick mind decoded the reason for that flaw. Fae spell contorted to look like wizardry: most wizards would miss the foundation hidden by the swirling energies. Pater Drakon never missed it. Sine Pearroc’s springtime arrival, Drakon had trained him. Pearroc had selected the aged man, one of the few clan leaders who supported Faeron. A Blade sent in secret to the wizards by his queen the Maorketh Alaisa, he fumbled like a child at some lessons. He didn’t regret his apprenticeship to the master wizard, but it was High Summer, and still he trained. The old wizard had a point. The Fae sparked power from the tangible element: a flame for Fire, soil for Earth, and on to Air and Water. Then they built the spell based on the power borrowed from the element.s Wizards needed nothing to spark power; it came from their essence. Though Pearroc wielded wizard-shaped power, he still needed a tangible element to initiate his spells. And as he fought to twist his spells to match to wizardry, he often dropped back to the easy Fae wielding. The sudden clash of steel against steel jerked his head around. Power sparked at his fingertips. Pearroc had met the ArchClans Letheina’s granddaughter. Puissant, brilliant, and arrogant, Alstera wielded all four elements. He’d heard rumors that she dabbled in the challenging fifth, the Chaos that few Fae could tap. She would indeed see the skirr that fragmented his spells. Chilling with a hint of autumn, a wind skirled around the ring and gusted through the balconies. It disturbed only the few spectators. Drakon, in his sheltered box, tucked his heavy cloak closer. He laughed. The sound turned into a cough he muffled in the wool of his cloak, and Pearroc thought again of the shorter lives of mortal men. The clan’s healer had warned Drakon only yesterday against exertion. Today he insisted on touring the entire arena before they came to his balcony box. When the spasm passed, he leaned his head against the high chair-back and breathed. The cane-wielding duelists had departed. Five new people had entered, one of them a woman. As the new duelists prepared, he studied the woman. Her youth had passed but not many years ago. Her plaited dark hair looked stark against the white linen shirt. Long legs were encased in deerskin, same as the men, and Pearroc admired their length and shape. When she turned, he saw the patrician bones that sharpened her face. Her swan’s neck would display rich jewels to advantage. What was a noble doing at the common practice arena? She said something that had three of the men chuckling. He recognized two as house guards for the ArchClans Letheina. The other two were Fae comeis bound to clan leaders. One was Vatar Regnant, bound to Pater duCian. The other—Pearroc looked closely—was the ArchClans’ comeis, Ruidri Talenn de Ysagrael, brother to Drakon’s comeis. He was the one shedding belt and scabbard, as the woman shed her shoulder harness. That pricked his interest more than her noble features. Fae did not spar against human opponents. Fae quickness proved too deadly. They used edged steel, not wooden canes. With a shocked inhalation, Pearroc turned completely toward the arena—and heard Drakon chuckle. The first flurry of blows rang into the seats. Testing moves, strength and agility and skill. Then Ruidri smiled and pressed an attack. He expected her to miss a parry, to stumble as she gave ground, to drop onto the sand, bleeding from a dozen cuts of the Fae’s blade. Her sword glinted with sunlight. She met Ruidri’s sword, deflected it through a rapid pattern taught to every student of edged combat. Ruidri’s grin widened. Pearroc knew that grin, having crossed blades with the elder Fae years ago, before he left Faeron and crossed to the human world on the Maorketh’s orders. The comeis changed the pattern. This time the woman grinned. Her defense didn’t depend on strength. Her blade slid along Ruidri’s or deflected it. Fae women learned these tricks. But this woman was no student. Her skill exceeded anything he’d see from humans. Ruidri gave ground to her attack. She didn’t step around the comeis; she flowed around him. Her blade was spell-quick. It lacked the flashing energy that would have charged it in battle. The Fae’s sword also remained energy-free. He said something that had her laughing, the sound ringing across the clash of swords and the grunts of the cane-using duelists. Their sparring changed again. The comeis increased to Fae speed. Pearroc held his breath, both fascinated and horrified. The woman couldn’t match his quickness and gave ground. Even so, she anticipated his thrusts. The ones she couldn’t guard against, she melted away from. The ones she didn’t deflect, she turned into throwing Ruidri off-step. He fell back. Lightning fast, she came after—only to stop on her toes when Vatar spoke. Her chest heaved. Sweat slicked her linen shirt while Ruidri merely gleamed with exertion. He spoke again then held his hand up in a Fae-to-Fae salute. And she returned it. “Who is she?” Pearroc demanded. “She is good, isn’t she?” Drakon croaked the words then started coughing. The woman heard and turned to look. She located the box. Eyes as black as Drakon’s stared up. Ruidri Talenn and Vatar Regnant looked as well, then Ruidri Talenn spoke to her. As Pearroc bent over his mentor, offering magic-infused water, he saw the woman shake her head. Vatar Regnant stepped closer, adding comments of his own. The magicked water eased the coughing spasm. Drakon looked shrunken inside his voluminous cloak. Fae trained to shield their emotions. Pearroc hid his shock. He had already embarrassed himself enough with surprise. Drakon had no acknowledged children. Magister Brandt was his nephew. In a clan filled with his bloodline, he had no direct heir. Pearroc glanced into the ring, but the two comeis and the woman had left. “Lady Camisse? Commander at Chanerro Pass? Her power is—.” He stopped before he offended. He smiled, a wicked twist that revealed his manipulations. The door to their balcony box opened. “Pater Drakon,” a man said. Huron Talenn retreated, leaving Pearroc to wonder what wiliness the Drakon patriarch had in play. Aristotle rocks because he’s a rock? 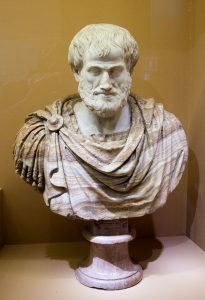 For writers beginning to Think / Pro, converting from a hobby writer to a professional writer, Aristotle seems like a wrong turn. Especially when we’re looking at the Essentials of Characters. Geez, what could he possibly know? I mean, look at him. He’s a bust. I thought this way, too–once. I mean, Aristotle is over two thousand years OLD. Really OLD. Decrepit. What on earth can someone so OLD tell me about story? I grew up with movies and TV. I have computers. And I drive a car. He had a banging chariot and scratched on something called parchment. He didn’t even have good paper and ink.